If you're looking for an author to kick-off your PARP program, and you're tired of the "same old stuff," then perhaps the Dirtmeister® is your man. 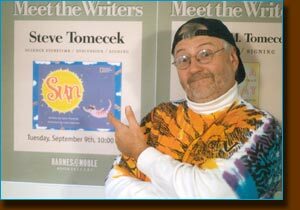 Steve the Dirtmeister® Tomecek has written over three dozen science books for both kids and teachers and he knows how to put a little "attitude" into his author visits. As a non-fiction author, Steve shows kids a different side of writing making the science/literacy connection. As part of his presentations, he explains how researching a non-fiction book is a lot like being a detective and why checking your sources is a critical step in separating science fact from science fiction! This high-flying program explores the history of flight while introducing students to the idea of researching a non-fiction book. From hot air balloons to rockets, people have always had a desire to fly. Using a variety of dynamic demos, The Dirtmeister® explores some of the science behind human-powered flight while reading some of the true stories behind the spectacular successes and tragic failures. Drawing on his books What A Great Idea! , Wing It! , and Stars , Steve encourages kids to follow their dreams and expore their own private universe through reading and books. It's a "dirty world" and that's a good thing, because without the soil under our feet, people would have a hard time living on the Earth! This program, which is specifically targeted to younger readers in grades K–3, explores some of the dynamics of dirt and discusses why it's one of the important resources we have on the planet. Drawing on the text of his widely acclaimed National Geographic Book Dirt , Steve demonstrates some of the properties of soils, shows what it's made of and where it comes from, and encourages students to get down and dirty with some of their own soil experiments that they can do at home. The Dirtmeister® concludes his presentation with a discussion of why and how he wrote his book, and challenges kids to go out and write about subjects that they love. This high-energy program takes a slightly serious look at a dozen different inventions that helped change the course of human history. Beginning with the wedge, participants discover how simple machines helped give early humans an advantage over the rest of the animal kingdom. Traveling through time, we look at how advances in electricity made everything from the radio to modern computers possible and how devices like lasers and telescopes help scientists in their quest for knowledge. Along the way, "The Dirtmeister®" discusses how he wrote his book, What A Great Idea , and explains what criteria he used to select the inventions found in the book. At the close of the presentation, Steve will answer questions about how inventions have changed over the years and what it's like to be a science writer and inventor. As a bonus, each organization that hosts this program will receive a free autographed copy of What a Great Idea ! This program encourages kids (and their teachers) to design their own simple science experiments using some "dirt cheap" materials found in most homes and classrooms. Most of the experiments featured in the program come from Steve's highly acclaimed books, Simple Attractions, Soda Bottle Science, Sandwich Bag Science, and Coffee Can Science. As part of the program, Steve explains how he develops his books and how doing first hand research is an important step in the development of all nonfiction books. In addition to his large audience PARP programs, Steve is now offering workshops for small groups that specifically focus on the nonfiction writing process. The workshop begins with a comparison of fiction and nonfiction books, highlighting the differences between the two. Using examples from his own books, Steve shows how an author structures a book by first selecting a topic and then developing a "plan of attack". Students learn why the most important part of a nonfiction book is to conduct quality, original research and why "surfing the web" is not always the best way to get accurate information. The workshop concludes with a discussion of how to develop an engaging topic and how an author uses different "hooks" to engage an audience. This workshop is best suited for students in grades 2-8 although it can be adapted for students in younger grades. In order to encourage maximum participation, each workshop session is limited to about 50 students. Workshops cost $200 each with a minimum booking of three sessions. Additional travel fees may apply for locations more than 100 miles from either New York City or Oneonta, NY.